Narrator: Speakers, publishers, consultants, coaches and info marketers unite. The Speaking of Wealth Show is your roadmap to success and significance. Learn the latest tools, technologies and tactics to get more bookings, sell more products and attract more clients. If you’re looking to increase your direct response sales, create a big time personal brand, and become the go to guru, the Speaking of Wealth Show is for you. Here’s your host Jason Hartman. 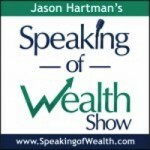 Jason Hartman: Welcome to the Speaking of Wealth Show, this is your host Jason Hartman where we discuss profit strategies for speakers, publishers, authors, consultants, coaches, info marketers, and just go over a whole bunch of exciting things that you can use to increase your business to make your business more successful and more and more passive and more and more automated, and more and more scalable. So we will be back with a great interview. Be sure to visit us at speakingofwealth.com. You can take advantage of our blog, subscribe to our RSS feed, and many other resources for free at speakingofwealth.com. And we will be back with a great interview for you in less than 60 seconds. Female: I never really thought of Jason as subversive, but I just found out that’s what Wall Street considers him to be. Male: Really, now how is that possible at all? Female: Simple, Wall Street believes that real estate investors are dangerous to their schemes because the dirty truth about income property is that it actually works in real life. Male: I know. I mean how many people do you know, not including insiders, who created wealth with stocks, bonds, and mutual funds. Those options are for people who only want to pretend they’re getting ahead. Female: Stocks and other non-direct traded assets are losing gain for most people. The typical scenario is you make a little; you lose a little and spin your wheels for decades. Male: That’s because the corporate crooks running the stock and bond investing game will always see to it that they win. This means unless you’re one of them you will not win. Female: And unluckily for Wall Street, Jason has a unique ability to make the everyday person understand investing the way it should be. He shows them a world where anything less than a 26% annual return is disappointing. Male: Yep. And that’s why Jason offers a one book set on creating wealth that comes with 20 digital download audios. He shows us how we can be excited about these scary times and exploit the incredible opportunities this present economy has afforded us. Female: We can pick local markets untouched by the economic downturn, exploit package commodities investing and achieve exceptional returns safely and securely. Male: I like how he teaches you how to protect the equity in your home before it disappears, and how to outsource your debt obligations to the government. Female: And this set of advanced strategies for wealth creation is being offered for only $197. Male: To get your Creating Wealth Encyclopedia book 1, complete with over 20 hours of audio, go to JasonHartman.com/store. Jason Hartman: Hey it’s my pleasure to welcome Anthony Krumeich to the show. He is the founder and CEO of Bloodhound.com, which is an event. . .well I guess a company that helps people plan and organize and execute tradeshows and events. And I want to talk to him today about his success story. He’s the ripe old age of 26, had some good success, and then also talk about the business and how any of our listeners might use his company services as well. Anthony, welcome how are you? Anthony Krumeich: I’m doing well. Thanks very much Jason for having me. Jason Hartman: Well the pleasure is all mine. So you’re coming to us today from the San Francisco Bay area, right? Anthony Krumeich: That’s correct I’m in San Francisco. Jason Hartman: Fantastic. Well give us a little bit of background on your story and how you got to where you are. Anthony Krumeich: Yeah, sure thanks. A little bit of an interesting path. I grew up as a science geek and that’s what I was gonna go to college for. I was one of the winners of the intel international science and engineering fair in high school. And I went to college I studied mostly neuroscience and mathematics and didn’t even really think about tech, and then I got towards the end of school and then I had had a family member that in the past had done a tech company out here and started looking at it and I was just like wow that sounds a lot more exciting than grad school. And so decided to team up with my freshman roommate from college and we were very interested in mobile and all the data that would be coming out of there. Just thinking about the fact that people would be using mobile applications and all these different scenarios in their life. And you’ve got access to a really novel data source, and could you use that to start to personalize the experience they have with the world around them the same say that amazon.com started to personalize their website when you went to it using the data that they had about how you were interacting with it. And so events are where we ended up focusing on. You know commercial events, trade shows, but also couples conferences and networking events and even music festivals and that kind of thing. Jason Hartman: Great. Was there a competitor in this space or how did you really think this is the right choice? You were interested in tech you said. But why this? Anthony Krumeich: What really started to interest us about events is that we realized looking at the way that business-to-business commerce worked that events were playing this really critical role in helping connect buyers and sellers. Something that’s 30% of the marketing budget for B2B was going into these events and it was like. . .and you know everyone knows about these events in their industry, right. They’ve gone to a couple of the conferences or they’ve 00:06:01 tradeshow or something. When you start to realize that every single industry has, no matter how small it is or crazy it’s like there are all of the tons of events in that industry for it and this is how they are connecting buyers and sellers. And so we looked at it as something that’s more of just a problem of it’s really hard to connect buyers and sellers. And so we figure we’re gonna start by trying to improve that at the events themselves. We’re gonna bring mobile technology in there, have everybody using it, the exhibitors and the attendees and then use all that data and everything we know to help do a smarter job of connecting the right people, getting you the right place faster, you know saving everyone time. Jason Hartman: Good. What was the story of the founding of it? Was it just you, you and a partner, working out of the house I assume? When did you start to raise money for it, etc.? Like give us a little timeline on that. Anthony Krumeich: I teamed up with my freshman roommate from college. He had been a computer science student at Stanford. We teamed up in early 2009. It was me, him and my dog, Champ, I got a boxer, he’s been with me the whole time, very loyal employee. As long as I keep the food coming each day and then he’s happy. We teamed up in 2009. The initial product we were working on was pretty different. We weren’t yet focused on events. We were also working on something that was mostly like text and SMS, text messaging based cause we weren’t sure that mobile applications were gonna have to. . .you know having adoption enterprise we wanted to see. In 2010 is really when we kind of got our groove starting to focus on events. So we went into a private beta period working with a bunch of different events, trying to understand what the needs were, early version of a mobile app for them. And came out of that and that’s when we’re like okay we’ e got a really good sense of what kind of platform we need to build to go after this. So we raised a little bit money then from a number of angel investors, a small round. Jason Hartman: Do you care to call how much? Anthony Krumeich: It was around $250,000 and you know it was disguised like 500 startup, Stu Mcclure, Jason Pointnoid, some of other advisors that worked with the company. Some of the organizers actually, one of them who had worked with us had ended up investing and so we raised a little money, we built the product out, we launched it in September of last year. So about a year ago we launched it to the public. We started having success. We raised a large around closer to about $1.5 million still from angels and everything in the spring. And that was it we got a bunch of new angels investors involved. It allowed us to build out the team some more so we’re 12 people right now. And then lately have had. . .it’s really accelerated in the last 3 months enormously. And then we’ll raise some more funding and continue to grow the team and grow the operation. Jason Hartman: And so 3 rounds of funding then? Jason Hartman: Okay so $250 and about $1.5 million was round 2? Jason Hartman: And round 3, was that angels again or did you go to VC this time? Anthony Krumeich: Well that’s a mix and that’s something that we are right in the thick of right now. Jason Hartman: Okay so can’t talk about that one too much probably right. And what has the growth been like? You talked about the fundraising. And what does the company look like nowadays and in terms of employees and locations and so forth and customer based. Anthony Krumeich: Yes, so earlier this year we kind of raised that last round we got people involved. We were having decent success. We had about 1 event per day signing up. So at that point basically the way the model worked was an organizer of an event signs up, they get going for free. They’re gonna provide an event after the attendees and they’re gonna tell their exhibitors to claim their profiles and that kind of thing. But really they were driven by the organizer. We started to launch some neutrals for the exhibitors and the way for the organizers to make money using our service in September, later September. So that kind of set the model off. So went from one event per day signing up earlier in the year. We had 2.5 events per day signing up in August, and then we had over 7 events per day in November and December we’re north of 10 events per day signing up. We’re in, I think, over a third of the world’s countries right now. So about 20% of our growth is international. Then just seeing a lot of events signing up farther and farther out for things that are coming up even later 2013, early 2014. Just big events that are in all sorts of industries, everything from technology to healthcare, from power sports, and consumer expos and education and everything in between. There’s a real crazy range of events out there. Jason Hartman: I mean it’s a big market isn’t it, there are so many events all over the world there’s just zillions, not an exact number by the way, events every day right for all sorts of different things. Is there a certain size range event that this would make sense for people or for an event planner to use? Big/small, what type of a customer? Anthony Krumeich: Because we made the product very self-serve and very scalable, it works everything from the small one to the big one. So what’s attractive I think to some of the really small events and organizers, ever if they only have 20 exhibitors, or even no exhibitors and it’s just mostly a conference, or a networking thing, or even a yoga festival we’ll have using it. What’s nice is that they can get access too. They can have mobile app now for their event when they never could have before. And we’re not going to charge them. For us, those events are like free marketing that’s great we’re happy to have them. The events that are really the best use case of our technology though is basically the more chaotic it is, the better Bloodhound is gonna be able to do there, the more help we’re gonna be able to provide. Because it’s like you walk onto a show floor with 800 exhibitors or we are talking to one in China that just signed up it’s got 6000 exhibitors, you know and 300,000 attendees. There’s no way you could even know where you want to go. Let alone everything you’re missing out on, navigating sessions, what’s relative to me, what am I not realizing. Oh we can tell something’s popular based on the data, lots of people are connecting with that company and they’re in your space. You should go talk to them or connect with them. So the bigger events are an even better use case. We’re still not charging the organizer in that case. But that’s where they can make money using our service by providing the lead retrieval application to exhibitors. So that’s where you get all the parties involved and it goes really well. Jason Hartman: So when someone uses your mobile application you said you make a mobile app for them, is it branded for them? I mean does it have their look and feel or is it your look and field with sort of the name of their event at the top or something? Anthony Krumeich: The short answer is we can do both. The longer one is that the small events sign up and they’re running on the Bloodhound app usually. So people are downloading the Bloodhound app and they just load up that event. But for any event that’s larger that’s gonna have. . .you know it’s gonna be offering lead retrieval , it’s gonna be an event where we’re gonna be making money, we’ll spin out a totally branded one where they can set the colors and the graphics and customize all the sections they want to have in it, and connect them, link them to each other in different ways. And all of that is possible through. . .you know we’ve got a dashboard that they can use and account managers they talk to and that kind of thing. Jason Hartman: Good stuff. How many employees now? Anthony Krumeich: So we are 12 right now. Jason Hartman: So 12. You care to share, and I know this is optional some people do, some don’t, but you care to share any revenue or milestones, or anything like that. Are you profitable now? Anthony Krumeich: We’re not profitable right now. The main reason being that there’s a really large. . .you know we are doing a lot of bookings, but it’s for events that are coming up farther in the future, so the revenue doesn’t come in until later on. Jason Hartman: Until the event occurs. But you can really gage your pipeline pretty well because how far out are those events? Are they 6 months out, like do they start using your service maybe 6 months out or how far out? Anthony Krumeich: The farthest is about 12 to 14, so 12 to 14 months out. But most of them are 6 to 12 months out. And get your pipeline fairly well. You note the side, you know how much usage or you’re gonna approximate the adoption that you’re gonna get and you know the value of it and so on. Jason Hartman: What advice do you have for people who want to go into area of business, or especially the technology space? I’m sure it hasn’t all been probably easy and smooth has it? Nobody says yes to that question. But any thoughts or advice you’d like to share? Anthony Krumeich: Yeah I think what I’d say is that both me and my cofounder were coming more from a science backgrounds, and we didn’t have a business background. And for people that are in that position I would say realize that you can learn what you need to, particularly because you can go and take the scientific method and the things that you learned in the classroom with your training and apply them in the business world. Like there’s a lot more overlap I think than people realize, and you can use it to test hypotheses about what features are gonna work, what do customers actually want. You know how are they gonna use the product, which way is the marketing gonna work. And you can take a very analytical and quantitative approach to building a business. And so that’s one piece of advice just about kind of translating skills you have in other areas into the business world. Then the other one I just would say is for people to think about what they want to be. Especially young people. You’re coming out of school it’s like it’s very easy to be attracted to taking a job in consulting, or ibanking, or maybe you’re gonna go the lawyer route. What I always ask myself was you know what’s my 40 year old version of myself going to be proud of in the future. You know assuming I’m gonna be fine one day, sitting pretty, you know I’ll have a family I’ll be doing alright. Looking back what decisions am I gonna be proud to have made. And that’s what you know cause me to think you know I want to take the risks, you know I want to take the risks to try to do something right now, and cause I want to tell my kids to you know take those risks, and how can I do that if I don’t. And so that helped me in a confusing time. I was trying to figure out what path am I going down. What profession do I even want to be doing to think to realize that I wanted to kind of bet on myself and take a chance on this and get comfortable being uncomfortable, taking that risk. Jason Hartman: So risk taking that’s the upshot of that bit of advice. Jason Hartman: Okay, anything else? Anthony Krumeich: The other one would just be to try to surround yourself with people better than you. I mean I think people are often times, you know especially if you’re smart, you’re used to being the best at a bunch of different things you did. And the best thing you can do for a company is to end up making yourself the dumbest one in the room. You know if you can [00:15:42] everything they do, that’s a perfect situation. It takes a lot of humility. A lot of people aren’t comfortable with that; they’re not comfortable given their reins on different parts of the company. But if you can appreciate the value that that brings then you can make somebody responsible for this and I’m gonna trust you to do a great job with it and we’ll check in on the metrics, but you can make the decisions here I don’t need to micromanage. I think you end up, as a company, in a really powerful position and then you attract even better people to you. And that’s a very competitive advantage of just being able to attract the best people possible to work with you alongside you. Jason Hartman: A lot of people are, I think, are intimidated by that by hiring people who are smarter than them. But that’s really what can make your company grow right? Jason Hartman: Good stuff. Anything else you’d like to mention on either side Anthony about the service, the product your company provides or any business advice that you have for people wanting to be successful. Anthony Krumeich: The products that I just said we’re very excited to. . .we’re starting to see people using our product even outside of events. So the whole lead retrieval side of it, companies being able to scan badges and then they can also start to scan business cards now, hook it up to whatever software they use for their customer relationship management and so we’re seeing companies subscribing and using it you know on an ongoing basis every single month. And that’s really exciting for us. And the business advice I guess that’s tide to that is pay a lot of attention to the way that your customers are using your product because often times they’ll do things and use it in a way you don’t even expect and it will tell you what you should be doing next. We had a case where just an exhibitor was doing a great job using the product in a really innovative way. When somebody walked into the booth, they scanned the badge, they kept talking. Somebody else in the booth refreshed their app, saw the lead, started taking the notes, so the first guy didn’t even have to break the flow of his conversation. Then they had somebody back at corporate see the note come in, follow up with the visitor with the literature they wanted and suddenly before the guy even walked out of the booth you’ve connected the loop on everything that that lead needed to have. And you know seeing that it’s like oh this is great that started to tell us what we can do to streamline that and make it easier for them and so paying a lot of attention not to what you think the way things are gonna turn out or how you think they’re gonna use the product, but how they actually do it. Jason Hartman: Yeah no question about it. And that customer, or I should say that prospect must have been incredibly impressed. They walk out of that booth maybe check their smartphone they’ve got an email, they’ve got a document that they need quested and things are really moving along. I mean I find that one of the things that’s really good advice for any businesses, make it easy for your customers to do business with you. Some vendors that I deal with from time to time, it’s like I’m trying to throw money at them. And they just won’t take it. It’s crazy. So make it easy to do business with you, wouldn’t you agree? Anthony Krumeich: Yeah and I say especially in the business-to-business space. A consumer people are used to having really easy products, there’s social network and that kind of thing. They’re like okay they expect the easy right? But then you go into the business world and for some reason it’s the opposite. It’s like now we’re gonna make everything as hard to use as possible, like totally hide you know the way the payment works, you get all the information you want. In some ways I think it’s really just kind of an old school model that’s headed out the door, but the companies that are trying to open that all up and do a much better job of putting the light to the way that people use their products and everything I think are gonna benefit exactly the way that you’re pointing out. People want to use them right? They want to pay them money and you should make it easy as possible. Jason Hartman: No question about it. One final question for you. What’s on the horizon for Bloodhound? What are some of the long-term plans? Anthony Krumeich: It was a definitely international growth right now. We haven’t made any focus on international, we’re still pretty small team, but we’ve, like I said, got about 20% of our growth international and something like over 70 countries or something like that. And so just starting to work with local partners and how do you optimize the product for that. And we support different languages right now but we can do a lot more with it. And it’s just interesting you go to China and you can’t even access Facebook and Twitter right through it, and you can access LinkedIn but nobody actually uses it. There are other forms of networking that they use and so suddenly you’re like actually the whole professional environment of my services play in and the value we’re providing has to be tailored for this market. Then that’s the case in all the other big markets that you would go after. And that’s been a really interesting recent learning experience for us and we’re. . .you know we’re figuring out how to we put the pedal down on a larger scale with a lot of different countries. Jason Hartman: And different customs and different government regulations in those countries. Obviously China censor very heavily, I have friends doing business over there. No Facebook, no YouTube, so you know different world, no question about it. Anthony Krumeich: You know absolutely. You got to pay a lot of attention to the customs, especially the government stuff, like you’re saying I mean that can dictate a lot of what usage is even possible, you’re literally not allowed to access Facebook and Twitter through China like you were saying. But some of the others obviously you can in. In my case we use that for a lot of our sign-ins. So suddenly if that’s gutted from the product, it’s like actually how are people signing it and I wouldn’t have thought of that beforehand until I took the time to actually realize what’s it like to be you know an internet user in China or to use a mobile phone or to network. And you got to put yourself in the minds of other people that you’re trying to actually reach in these places. Jason Hartman: Yeah, good stuff. Well Anthony, hey I wish you the best and thank you so much for sharing this with us today, it’s very interesting. Anthony Krumeich: I really appreciate you taking the time. Thank you so much Jason. Announcer: What’s great about the shows you’ll find on JasonHartman.com is that if you want to learn how to finance your next big real estate deal there’s a show for that. If you want to learn more about food storage and the best way to keep those onions from smelling up everything else, there’s a show for that. If you honestly want to know more about business ethics, there’s a show for that. And if you just want to get away from it all and need to know something about world travel there’s even a show for that. Yep there’s a show for just about anything only from JasonHarman.com, or type in Jason Hartman in the iTunes store.